Rim board fills the space between the sill plate and the bottom wall plate, or between the top plate and the bottom plate in multi-floor construction, filling the void to add an integral structural component that transfers both lateral and vertical forces. T-TEC LSL Rim Board is preferred by builders because it’s a highly predictable and uniform engineered wood sawn to consistent sizes and resistant to warping and splitting. We designed T-TEC LSL Rim Board to be compatible with the new generation of engineered wood I-joists. Our continuous press at our T-TEC LSL facility manufactures LSL that’s more uniform along its length, with fewer voids and a better surface-quality than sawn lumber. With a blue coloured edge seal to protect it from the elements, and with Zinc Borate protection as an option to protect from fungal decay and insects, T-TEC is highly durable. To make sure it reaches you in the same state it left our factory, we take care in packaging our rim board, using our new tear-resistant, woven-poly bags. To meet green building standards, there’s no added urea formaldehyde (NAUF) in our rim board. 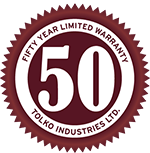 Backed by a transferable, 50-year limited warranty. call our lsl sales team to talk about t-tec lsl rim board.